We’d love your help. 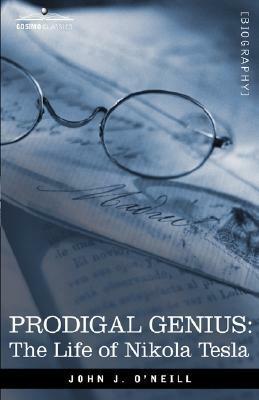 Let us know what’s wrong with this preview of Prodigal Genius by John J. O'Neill. To ask other readers questions about Prodigal Genius, please sign up. From the reviews here, I'm assuming there are probably better books about Tesla for a reader who prefer biographies to stick to the facts and leave the idolatry out. Any tips? I had known a good amount about Tesla and sort of idolized him already so it was really a matter of which of his many biographies would present his story in the best way. This looked like the quintessential one. Tesla was a brilliant inventor and visionary in electricity and telecommunications (though hardly receives credit outside the scientific world), all stemming from the discovery of one "truth of overwhelming importance for the advancement of humanity." "That this planet, with all its appa I had known a good amount about Tesla and sort of idolized him already so it was really a matter of which of his many biographies would present his story in the best way. This looked like the quintessential one. Tesla was a brilliant inventor and visionary in electricity and telecommunications (though hardly receives credit outside the scientific world), all stemming from the discovery of one "truth of overwhelming importance for the advancement of humanity." "That this planet, with all its appalling immensity, is to electric current virtually no more than a more than a small metal ball... A telegraphic message, almost as secret and non-interferable as a thought, can be transmitted to any terrestrial distance, the sound of the human voice, with all it's intonations and inflections, faithfully and instantly reproduced at any point of the globe, the energy of a waterfall made available for supplying light... Humanity will be like an ant heap stirred up with a sick. See the excitement coming." - Tesla, 1900. And Edison was just the worst! Total venture capitalist exploiter which still has its use in the world but that's not what he's hailed for. It is a pet peeve of mine when biographers speculate on the person's personality or motives and John O'Neill did that quite often so I was bothered by his writing while reading. I think biographers ought to simply tell the story, tell it well, and let the reader draw whatever conclusions on the person as he or she may. By comparison, I'm reading Master of the Senate about LBJ right now as well and Robert Caro is brilliant. However, my attitude changed in the last chapter when Tesla says "Mr. O'Neill, you understand me better than anyone in the world." I suppose he can speculate. They don't write biographies like this any more. But the crazed gushing style, weird sexism, and total lack of documentation make this strangely fun. I don't believe anything in this book, but I still enjoy reading it. I really liked the bit where at a young age, Tesla made a 16 Junebug powered motor, and the son of an Army commander comes over and eats all of Tesla's spare bugs. This whole book is just that weird. Finished it. Tesla was an amazing man, with a towering intellect and enormous f They don't write biographies like this any more. But the crazed gushing style, weird sexism, and total lack of documentation make this strangely fun. I don't believe anything in this book, but I still enjoy reading it. Finished it. Tesla was an amazing man, with a towering intellect and enormous flaws. The worst seemed to be he stopped learning after his success with alternating current. He even railed against the existance of subatomic particles. The AC current that comes from every wall socket in the world comes from generators that are still based on his designs. He changed the world as much as Edison, but died in obscurity. His last days were very sad, the only love he ever showed was to a lady pigeon. I find it curious how much time and energy is devoted to debating questions of primacy with the discovery of theories and machines. I've read biographical info on Tesla and Newton and Leibniz, and much of the extant written record of their lives and contributions to science come in the form of editorials and letters to newspapers and societies proving with great attention to detail exactly when they discovered this or that concept. It's an exercise in differing perspectives: at the time, all of t I find it curious how much time and energy is devoted to debating questions of primacy with the discovery of theories and machines. I've read biographical info on Tesla and Newton and Leibniz, and much of the extant written record of their lives and contributions to science come in the form of editorials and letters to newspapers and societies proving with great attention to detail exactly when they discovered this or that concept. It's an exercise in differing perspectives: at the time, all of that was super important. But a hundred plus years after their deaths, it's hard to find it relevant. Tesla is to electricity as Mozart was to music. Both devoted thousands of hours of their childhoods to studying their respective fields, at great cost to any other social or leisure activities. Tesla completed a little over two years of college in one year by sleeping only ~3 hours a day, and devoting almost all the rest to study and examinations. He almost killed himself doing it, and suffered frequent illnesses brought on by total exhaustion. But by the time he was in his early twenties, Tesla understood electricity on such an intuitive level that his demonstrations and theories seemed downright unnatural to any other person -- if mundane and prosaic to a modern person today. In the late 1800s, Tesla described in detail the plans for an unmanned aerial assault vehicle, not unlike modern day Predator drones. Tesla offered to build these automated flying machines capable of delivering targeted strikes for the US government, but he was laughed out of the office. At the same time, Tesla offered the leading car manufacturers of the time a contract to build fully automated passenger vehicles, not unlike the driverless Google cars that are in alpha testing today. Again, he was laughed out of the conference room. He believed he could deliver electricity from power plants wirelessly, across the globe, with need for only two power plants at the global poles. In a time when the world marveled over transatlantic telegraphs, Tesla knew how to build a global radio transmitters that could send video across the planet. It sounded crazy to his contemporaries, and yet what he did achieve, and what we now know today, make it seem likely that he could have delivered on those plans. Before Tesla, the only way to get electricity was to live within one mile of a power plant. Infrastructure had been built around the world to bring the wonders of the electrical age to all major cities -- but only major cities, and only certain neighborhoods. One electrical plant per square mile was difficult, and expensive, to manage, but that is where the world was headed, until Tesla broke all existing electrical theories and developed a way to deliver alternating current thousands of miles from the power plant, with virtually no loss in strength. His alternating current model was adopted globally, and spurred on the development of the modern age. The power transformers that are in preciously limited supply in the US today were designed by Tesla. Tesla had a big heart and his greatest weakness was his insistence on viewing the big picture. He wanted to bring the greatest benefit to the greatest number of fellow humans. But so many of his great inventions died with him, because he refused to write down any of his ideas, and he would only develop his visions on the grandest, global scale. He could have made thousands of dollars, enough to keep his lab running, had he been willing to sell smaller-scale versions of his visions. For example, he developed a world wide broadcasting system before radio stations existed. His claims for wireless transmission of data were received with a great deal of skepticism, but a boat race offered him a good sum of cash to use his system to broadcast, wirelessly, the results of the race from the boats to the shore. Tesla turned this down because it was too small scale. He would build a global broadcast system, or none at all. It's just he never quite got enough money to build the wholly custom equipment needed to complete the global broadcast towers. If he had been willing to start small, he could have built the capital needed to build the big machines. Tesla intended to live to 125, and told his friends he wouldn't write down any of his ideas or theories until the age of 100. Plenty of time, he believed, to get it all down. He was too busy developing new concepts to write anything down. Tesla had by all accounts a truly flawless photographic memory. So perfect was it, that what he imagined in his head he saw in reality as a full-formed hallucination. He could literally imagine an engine, take it a part piece by piece, and put it back together again. He built prototype machines entirely in his mind, and then verbally recited the dimensions of the pieces of the engines to the machinists who cut the metal. He never had to adjust any of the pieces -- they fit together perfectly, dictated from his head alone. He saved a great deal of time in not having to write down blueprints, or work by trial and error. The author of the biography knew Tesla personally, and he resented Tesla's atheism and thoroughgoing determinism. Tesla was know to describe humans as "meat machines" driven by the exact same principles of response to electrical stimuli as any of his dreamed of metal automatons. The better part of the biography reads factually and historically, but towards the end the author begins to insert his beliefs into the narrative. The author was sure Tesla did not really believe we were meat machines, and was not truly an atheist. When he told Tesla this, Tesla told him what he thought of others doing his thinking for him, and didn't speak to the author again for many months! The author of this book, James O'Neill, was clearly infatuated with Tesla. I've read a couple of other biographies of Tesla, so a lot of it was repeated, but I feel that this version does hold more depth. Two new facts I didn't know: Tesla had a phobia of pearls and a deep love for pigeons. If you're going to read a biography of Nikola Tesla, read this one. People who don't like biographies usually don't like how they just talk too long about the boring parts of the persons' lives, like the parts where nothing is happening in an action movie. It just doesn't make people want to continue. 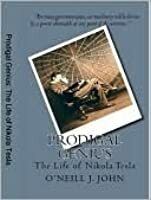 Prodigal Genius: The Life of Nikola Tesla by John J. O'Neill is not like that though. I like it because of that since I am one of those people. The theme of this book is really cool. Usually biographies are about the person. They say “Even though this information People who don't like biographies usually don't like how they just talk too long about the boring parts of the persons' lives, like the parts where nothing is happening in an action movie. It just doesn't make people want to continue. Prodigal Genius: The Life of Nikola Tesla by John J. O'Neill is not like that though. I like it because of that since I am one of those people. The theme of this book is really cool. Usually biographies are about the person. They say “Even though this information about this persons’ family didn’t influence him at all, we are still going to put it here”. This book doesn’t do that. The only information the author put in the book is the information that matters to his contributions to the world. It focuses more on what he created than the parts of his life. The different chapters of the book are more about different inventions than they are about different parts of his life. Anyone who reads the book will still know a ton about his life, even though it has a lot abut his inventions. I will start by saying that this edition isn't the one I read; the edition I have was written in 1978 and published by Angriff Press of Hollywood, CA. I didn't see that edition in the choices. That being said, this was a fast paced, highly intriguing, biography of Nikola Tesla--a truly remarkable person! The book is very much written in journalistic voice with a dash of that early 20th century writing style that I love to read in biographies written at the turn of the century. The book talks abou I will start by saying that this edition isn't the one I read; the edition I have was written in 1978 and published by Angriff Press of Hollywood, CA. I didn't see that edition in the choices. The book talks about many of Tesla's main experiments and relates several wonderful stories that I've had the pleasure of relaying to others with lots of fun. So much of the world we inhabit is due to the inventions of this man and his staff! O'Neill's descriptions of the different phases of Tesla's life, the different laboratories, the traveling Tesla did, the experiments--while not complete in any sense, one can read Tesla himself and be overwhelmed by the technical details about his experiments--,his eccentricities, his loves and hates, and the physical descriptions of Tesla at different points in his life, make this a remarkably addictive and engaging book to read. The one thing I feel I didn't get out of this book was the sense of personal antagonism held by Tesla toward Edison--and vice-versa--when they were competing between the AC and DC power systems. No doubt, there must be other bios dedicated to such things somewhere. Don't get me wrong; the War of the Currents is certainly within these pages, but perhaps I was looking for something more descriptive. "During the last three decades of his life, it is probable that not one out of tens of thousands who saw him knew who he was" (308). Tesla - genius. Not perfect. Full of idiosyncrasies. Not much common sense as far as money goes, OCD-ed, alone for the most of his life but giving up millions to help humanity, modest yet refusing a Nobel Prize (which was never officially awarded, only announced) due to pride. He was not an inventor, or so he would like to think. Instead he contributed fundamentals "During the last three decades of his life, it is probable that not one out of tens of thousands who saw him knew who he was" (308). Tesla - genius. Not perfect. Full of idiosyncrasies. Not much common sense as far as money goes, OCD-ed, alone for the most of his life but giving up millions to help humanity, modest yet refusing a Nobel Prize (which was never officially awarded, only announced) due to pride. He was not an inventor, or so he would like to think. Instead he contributed fundamentals to science: x rays, the idea of radio, and of course, AC. He didn't give up after a disastrous fire, used his last $5 to feed pigeons, and died alone in a hotel room. I found this book incredibly profound even though most of the electricity talk was over my head. Tesla was an amazing person and I was left with a deep what-if feeling at the end. How different would our world be if he had shared his later inventions and ideas? I thought it well written and though this was not a quick read--I frequently took breaks and read more entertaining books-- I really enjoyed this book. It was fascinating to read about this amazing man, a true genius, who dedicated his life to science, but whose activity was sadly hindered by financial issues and by the ignorance or envy of other leading scientists. Too bad the technical details were mainly lost on me, as I don't have the necessary background. I thought this was great, first book I've read about Tesla and a great intro. Written by a friend and contemporary, it takes a bit to get used to the style, but once you realize it, it's a great time machine. Definitely going to read more about Tesla and I find it amazing how forgotten and unrecognized he has become. I really like Tesla but this author is very repetitive and injects himself into the story way too much. I will have to find a better Tesla biography. 1 stars = Pass on this one. 0 stars = Couldn't finish it. Though I am fascinated by Tesla, I have to read this book as research, so it is slow going for me. I never could read textbooks with much enthusiasm. Update: I changed my mind. As I got into it more, I found I wanted to know more and more about Tesla and so then couldn't put it down. Some research on the Internet may have helped cause this enthusiasm. Actually, i've stopped reading it about a two weeks ago for simple reason: it's just a holy religious ****ing pamphlet about St.Tesla as a founder of the Boneless Manoly Church of Capitalistic Future of Социјалистичка Федеративна Република Југославија and nothing god-forsaken more. That's it. An eye opening read which draws the reader into the life of the man who invented the 21st century. Despite being a bit on the long side, it felt nearly impossible to put the book down. I would highly recommend this book to any fans of modern day technology. Goes into detail about his life work. Explains why he was such a brilliant mind. Worth your time. Check out the comic by the oatmeal as well. It's what got me into reading the biography. I couldn't get into the writing of the book. It's very dry and kind of impersonal, even though the writer supposedly knew Tesla very well. It also needs illustrations, for all the technical descriptions of Tesla's inventions for those not mechanically minded. Read 3/4ths of it. very interesting. Tesla was definitely a outstanding figure. Would like to know more about electricity and magnetism before i reread this though!! Fairly amazing man, with some very surprising quirks. The book has an interesting style, the author was a personal friend of Teslas and possibly a hero worshipper of him as well. A bunch of nice tidbits, but the overall effect is tedious. Life of Tesla, O'Neill does justice in this earlier work.